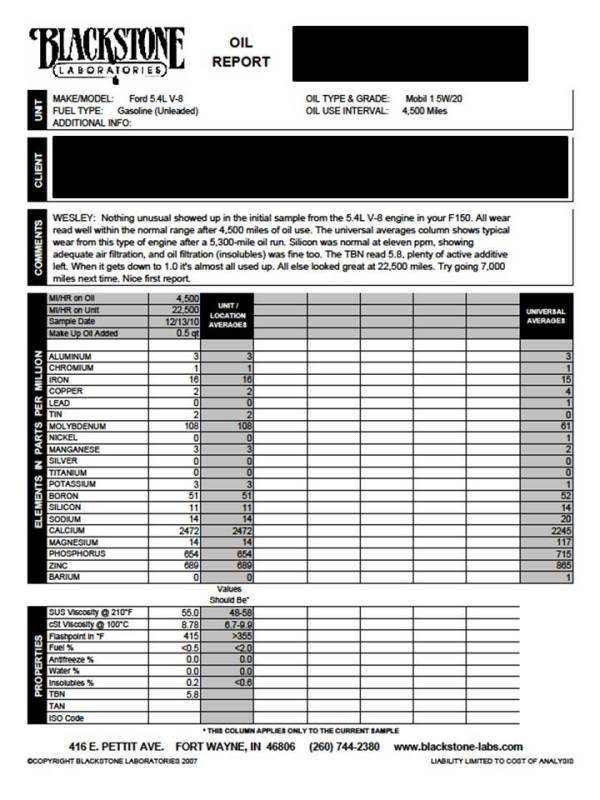 Just received the oil analysis back from Blackstone for the Motorcraft 5w20. I had been wanting to make the switch from Mobil 1 to Motorcraft due to the ever increasing price of Mobil 1 products. After this analysis I have decided to make the switch. The first report is for Mobil 1 and the second is for Motorcraft. They were spot on with their analysis of the higher iron levels as I had been towing more often and the majority of the driving was done during the winter months. I will be running Motorcraft for 5-6k miles from now on because thats where I'm personally comfortable with my oil change interval. I'm not posting this to start an oil rant. Just wanted to help anyone out that was interested. Thank's for posting this, although I ran Mobil 1 in my 5.4 that was in my old 04 truck I agree it's good oil but not worth the extra price over the Motorcraft oil. I just had my first oil change done at the dealer and went with the Motorcraft blend. Couldn't beat the free price either! Standard Mobil 1 is nothing special. However, Mobil 1 EP is a true premium oil. Are these both full syn oils? Motorcraft is a synthetic blend. Mobil 1 advertises as synthetic but my understanding is not. From everything I have read Mobil 1 is a Group III oil (I-III are dino oils and IV and V are synthetic). Motorcraft is roughly $3.50 a quart and Mobil 1 is roughly $8.50 a quart. Those factors and that Motorcraft is providing basically the same protection as Mobil 1 made it an easy decision for me. Last edited by Wes28376; 06-15-2011 at 01:27 AM. O'reillys had a sale on Mobil 1 synthetic a month or so ago for about $3.50/ qt. I bought a bunch. Walmart has a 5q jug of the Motorcraft 5W20 synthetic blend for $12 last time I bought it. That and the FL820S are great values. I know you need more than 5q for the F-150 engines, but still cheaper per volume. Motorcraft - synthetic blend. Made by Conoco/Phillips. Mobil 1 - Group 3 synthetic. Mobil 1 EP - Group 3 with a lot of Group 4 components. I've been running Motorcraft oil in my truck since I got it. Great oil! I've noticed with all of the Ford's I've owned is that they will tell you when they need the oil changed. Slight ping, the engine makes a little more noise. The one time I did NOT use non-synthetic oil in I noticed that I got 3k from an oil change, with Motorcraft I got 5-6k. I recently changed to Mobil 1 about 3 months ago. I hit 100k miles and plus there was a sale at O-Reily as mentioned before in this post for less than $3.50 a quart, I bought a bunch too.. Since running Mobile 1 I've noticed my engine running smoother, quieter, especially during start-ups. I plan on a 6-7k mile change interval with Mobil 1. If and when I get a new F-150 I plan on using the MotorCraft oil again. I'm just noticing for my high mileage truck (that is well broken in) a full synthetic makes a difference. The key here is no matter what you use CHANGE IT and stay with one brand dont be changing oil types every time somebody comes up with some new ju ju juice in ther oil that claims everything. Seen more than one fleet service place change the brand of oil they use because some bean counter saved $3.00 on a 55 gallon drum soon after the number of engine failures went up big time. So stay with one brand and change it. I know there are a ton of opinions out there but for my money you simply cannot beat Motorcraft 5w-20 blend. Factory approved and I believe a good oil plus a filter for less than 25.00 a change? Count me in. Agreed....I'm a member of the Bob is the oil guy forums and there are a ton of people on there with vehicles other than Ford that use Motorcraft because it is such a high quality reasonable priced oil. What chu talkin about ju ju juice!